KL: Congratulations on your Moose Mountain Marathon win. But we need to congratulate you on a couple other things as well. Your Superior run was sandwiched between an outstanding race at CCC in Europe where lots of us Midwestern runners were glued to the internet for your updates. And you have a wedding right after Superior. Briefly please tell us about the CCC, and how you felt coming into Superior. MB: CCC was simply incredible. Just driving into Chamonix, and seeing the sharp peaks of the Alps was a site to behold. Those mountains are something else. I went out there with Jake Hegge and Tyler Heinz. Silver Star Nutrition also sent out two guys, Bruce and Eric, to take pictures and help me on race day. The ambiance of the race is something special. The first climb of the race was over 6 miles with almost 5000 feet of elevation gain. To put it in perspective the Moose Mountain Marathon has 5,500 feet of climb total. During that first climb my legs were burning, I was stung by a bee, and developed a huge blister on my heel. But it was all worth it when I got to the top and was able to take a deep breath and take in the sights. The first half of the race I took my time, and tried to just take in the experience. During the race my nutrition went great, and when the second half hit I was able to really start pushing it and passed a lot of people all the way up to the finish to place 99 out of over 2000 starters in a very competitive field. I felt strong the whole day, and had a lot of fun with the race. As far as coming into Superior I didn’t know what to expect from my legs. I was very sore for several days following CCC, and my whole week was easy recovery runs. KL: Did you do anything different to prepare for two big races in back to back weekends? MB: As far as preparation the biggest thing I made sure to do was prioritize recovery in the two weeks leading up to CCC, and the week after. For training I didn’t do many miles, and any speed work I did wasn’t enough to make me sore, just keep the legs used to moving quick during that time. Nutrition was also important: I made sure to have plenty of fats and protein during the week between races. 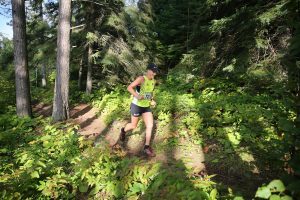 KL: This was a fast field for the Moose Mountain Marathon. How did the race play out for you? MB: Going into Moose Mountain I really just planned to go out hard from the gun and blow up around mile 15-20. I figured I would hit either the Carlton Peak or Moose Mountain climb and my legs would just say, Okay that is enough climbing. I really just wanted to have fun. So from the gun I went for it. I think it was James Sorenson (eventual 2nd place) that went with me initially. We rolled through the first aid station at Temperance close together. I didn’t stop there and knew that the Carlton climb was coming, so I just hit the gas to try to create a gap during that time. Once I hit Sawbill I had created a large enough gap that James was out of sight, and my legs were still feeling good so I kept pushing. The rest of the race I kept trying to push it because I thought either my legs would give out, or I would be caught and I wanted to be as close to the finish as I could before that happened. Climbing Mystery Mountain I kept looking behind expecting to see second place, but didn’t see anyone in sight. KL: You and Jake Hegge are coaching a lot of runners through Trail Transformation. Congrats too on the success of that endeavor. How has the coaching affected your own running? MB: Thanks, coaching has been a blast. It has allowed me to get to know more people in our running community, and has been extremely rewarding to see so many of them do well. I would say that the biggest way it has affected my own running is that I now think through my own training in a more structured way, and I ask myself would I have a coaching client do this or is this dumb? KL: What is something we should know about you that doesn’t involve running? MB: Two things to know about me that doesn’t involve running is that I am getting married to my best friend of almost eight years Allyson MacPherson this Saturday (9/23). She has been such a huge part of my life, and is a big reason for my success in running thus far. Number two, I will finally be finishing up Physical Therapy school at UW La Crosse this coming May. KL: Congrats on both of those life-changing events. Any upcoming race plans for 2018? MB: I am planning on running the Sean O’ Brien 100k in February. It is a golden ticket race for Western States. I will also be putting my name into the lottery for Western States (after two years off from 100s I finally have the itch again). I am also planning on running the Boston Marathon with my dad. And of course the Voyageur 50. If I don’t get into Western I may attempt to enter the Big Horn 100. Still not 100% sure what my Superior plans are for next year, but I will be there in some capacity.